Google’s response to WhatsApp and Messenger, Google Allo launched nearly a month back and since then it has been downloaded over 5 million times on Android Play Store. It was a hit or miss for many and what intrigued most was Google assistant built into the app. Fast forward one month, Google has released a major update for the app, called Allo 2.0. The update brings a lot of features that should have been supported by Nougat 7.0, and this means quick replies and split screen ability. This comes at a time when WhatsApp is adding a host of new features like video calling, gif support and a new interactive secret font. Allo is simply a text messaging app whereas it is trying to compete with ones that literally Duo+Allo in one app. 2 Will this be enough to take on other texting apps? Android Nougat 7.0 brought in quick replies from the notification bar, which made it extremely convenient for Android users to reply without opening the app. The chats could be cascaded and replied individually, giving flexibility to users. It works in a very simple way – all you have to do is drag the notification down, click on reply button and a pop-up will open to let you reply to the message. All of this without actually opening the app. The notification even suggest smart replies directly to reduce the amount of typing. A lot of apps still do not support split screen ability on Android Nougat, which makes Allo one of the very few to support it. All you have to do is open the task bar, long press on Allo and wait for it to move to the top side of the screen. Any other app that support split screen can simply be dragged to the screen, so that you can use both Google Allo and the other app at the same time, multi-tasking at its best. 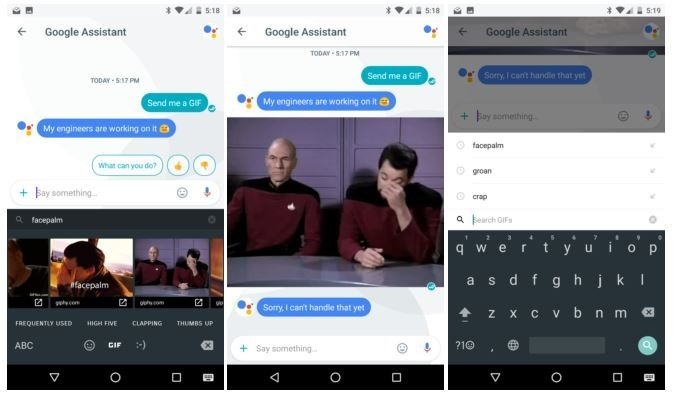 Now Allo can share GIFs on the latest version of Google Keyboard, on Android 7.1 and above. The latest keyboard supports GIFs and even offers suggestions to users. There are other smaller updated like incognito key alerts, splash screen and Android wear support, that won’t really be that huge an impact to our lives. Will this be enough to take on other texting apps? Will a standalone texting app, Google is making users download two apps for a simple job of communication. Personally, I have seen people using Allo only for the assistant feature, that does its job perfectly fine. However, WhatsApp has been here for so long that it is difficult to make people migrate from one platform to another. The second issue is that Google stores all the chat information for machine learning purposes, which is good for users in terms of responsiveness of the chat assistant, but insecure in terms of privacy. Finally, Allo is merely a combination of WhatsApp, Hike Messenger, Facebook Messenger and Telegram into one app, which doesn’t make it stand out really. Yes it’s a good app, but it doesn’t add significant value to a user’s life. We wish Google combined Allo and Duo in the end to create an all-in-one app. "Google Allo 2.0 Update Brings GIF Support, Split Screen, Direct Share Ability & Quick Reply from Notifications", 5 out of 5 based on 1 ratings.